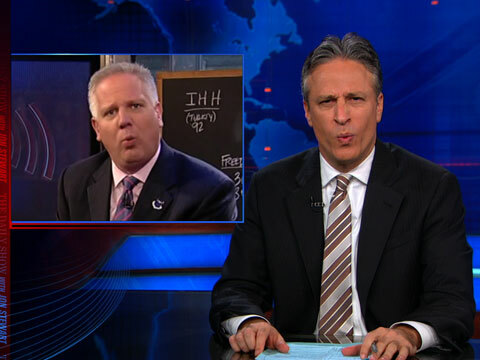 On Wednesday on The Daily Show host Jon Stewart invited the conspiracy fearing Fox News pundit Glenn Beck to appear on his show. Beck never invites guests onto his own one man show, so Stewart feels it might be interesting to see how the conservative broadcaster would fare if someone finally answers him back. As an incentive, Stewart promised Beck a five-pronged chalk holder, a reference to Beck's frequent use of chalkboard diagrams to convince his two million strong audience. "Imagine, you could get five people connected to George Soros," Stewart joked. The chances Beck will take the bait are pretty slim. Unlike fellow Fox pundit Bill O'Reilly, Beck shows no willingness to tackle his detractors, including Stewart.